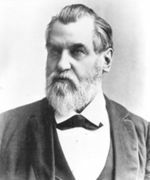 Leland Stanford (1824-1893) was a railroad tycoon, California politician and founder of Leland Stanford Junior University which became Stanford University. Born in Watervliet, New York, he moved to California during the gold rush in 1852 and became President of the Central Pacific Railroad in 1861 and was continually involved with various railways until his death. Stanford was a lifelong Republican and very politically active being the Governor of California from 1861 to 1863. Stanford was elected to the United States Senate in 1885 and served until his death. This page was last modified on 25 July 2016, at 12:12.